TSPSC Statistical Officer Recruitment 2019: Telangana State Public Service Commission has released the Online Application Forms for the Direct Recruitment exam having the purpose of selecting worthy candidates for the vacant posts of Assistant Statistical Officer/Mandal Planning and Statistical Officer. 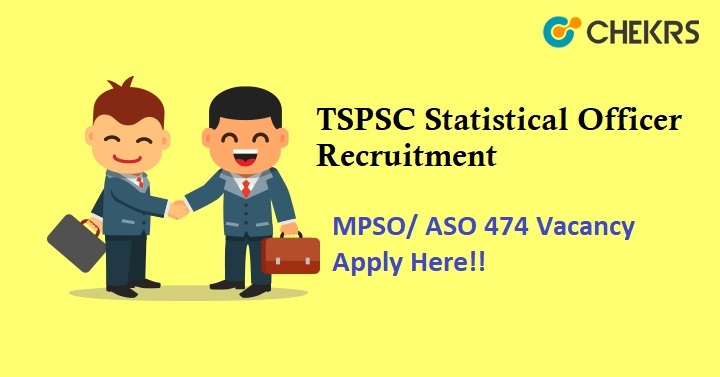 If you are willing to apply for TSPSC Assistant Statistical Officer Recruitment 2019 before the last date. The examination will be either Computer Based Recruitment Test (CBRT) or Offline OMR based as per the TSPSC ASO Notification 2019. Latest Update: TSPSC is going to publish the Statistical Officer Recruitment 2019 for various vacancies. Interested candidates can complete the online application form before the last date from here. The Telangana State Public Service Commission has released the MPSO and ASO Recruitment 2019 notification to fill the various vacant Posts. Telangana government is on his way to provide better job opportunities in Government Sector to all the qualifying candidates. The TSPSC Assistant Statistical Officer Vacancy 2019 is one of them. Now, it is totally up to you whether you succeed or not. As per the Telangana MPSO Recruitment Notification, we have provided all necessary and authenticate info like eligibility criteria, selection procedure etc. in our article. Refer to the below-specified table to get the knowledge of all important dates regarding the recruitment. Before applying for the posts, candidates shall register themselves as per the One Time Registration (OTR) through the Official Website for TSPSC. Then, you will have to fill your TSPSC Assistant Statistical Officer Application Form 2019. Open the online portal of TSPSC. Search for TSPSC ASO Recruitment 2019. Select the ‘Apply Online” option. Register yourself for One Time Registration. Click on the “Confirm and Continue” tab. Go ahead to the application form. Upload your photo and signature. Collect all the necessary printouts such as fee receipt, application form etc. The mentioned amount of application fee for the TSPSC MPSO Vacancy 2019 should be paid via Online Mode through SBI ePay only. The fee shall not be refunded or adjusted under any circumstances. Note: – OBC’s, SC’s and ST’s belonging to other states are not exempted from payment of Application Processing Fee and Examination Fee and they are not entitled to any kind of reservation. The candidates, who possess requisite qualification and follow all the necessary eligibility conditions described below, may register themselves for TSPSC ASO Jobs 2019. Applicant must hold a Bachelor’s degree in the relevant field from a recognized University/Institute. Age relaxation will be allowed for the reserved categories as per the norms prescribed by the government. Remarks: We will be happy to get any queries or doubts about TSPSC Assistant Statistical Officer Recruitment 2019 from your side so, feel free to comment on us.